For the aluminum sheets we have used aluminum tape of 0.1 mm thickness. overlapping more than one layer it is possible to prepare sheets of different thickness, as shown in the images below. 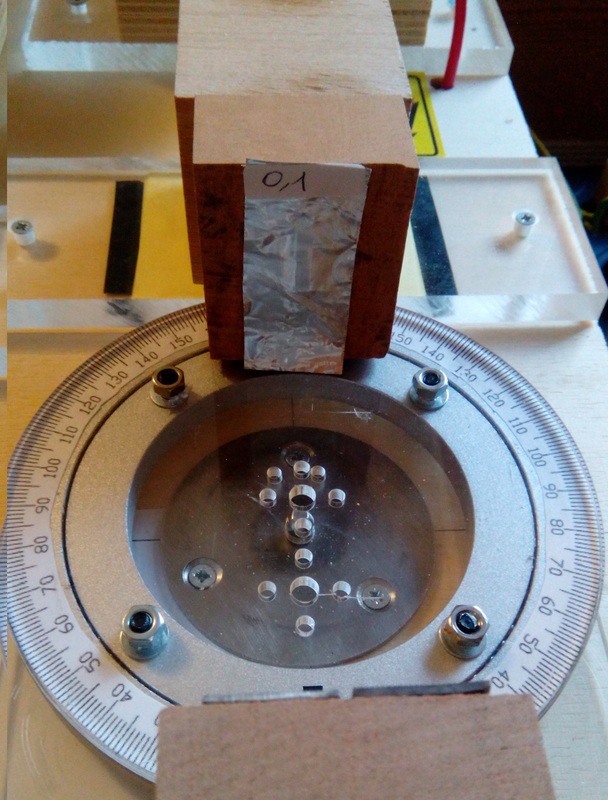 To take absorption measurements we used the DIY diffractometer with the Germanium X-Ray tube, putting aluminum sheets with progressively greater thickness in front of the collimator and measuring the intensity of the transmitted radiation with the geiger counter. The picture below shows the setup. 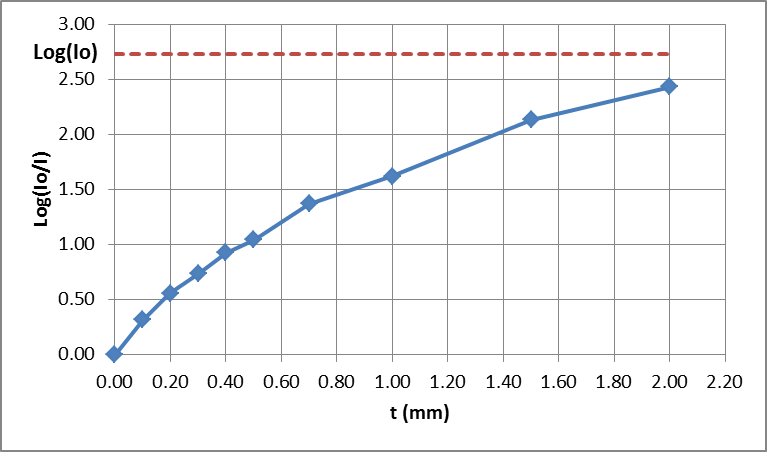 We did measurements for aluminum thicknesses ranging from 0.1 mm to 2 mm, at two different voltages, 30 KV and 40 KV. 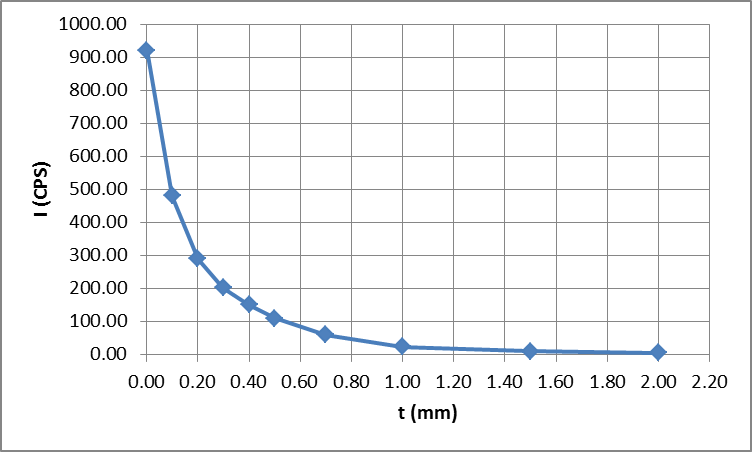 We put the data (radiation intensity vs thickness) into linear-scale and logarithmic-scale charts. Since Log(I/Io) is smaller than the correct exponential value, as it can be seen in the charts, then the intensity I alone must be responsible for the deviation and it must be larger than theory predicts; this in turn infers that the x-radiation is becoming more penetrating as it passes through the aluminum. 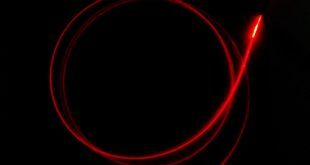 This is only consistent with the law of conservation of energy if not just one homogeneous wavelength but heterogeneous mixture of wavelength comprises the primary x-ray beam. This is similar to white light and such heterogeneous x-radiation is called “white” radiation. Thus the x-ray radiation emitted by the Germanium X-Ray tube is not all of the same wavelength. 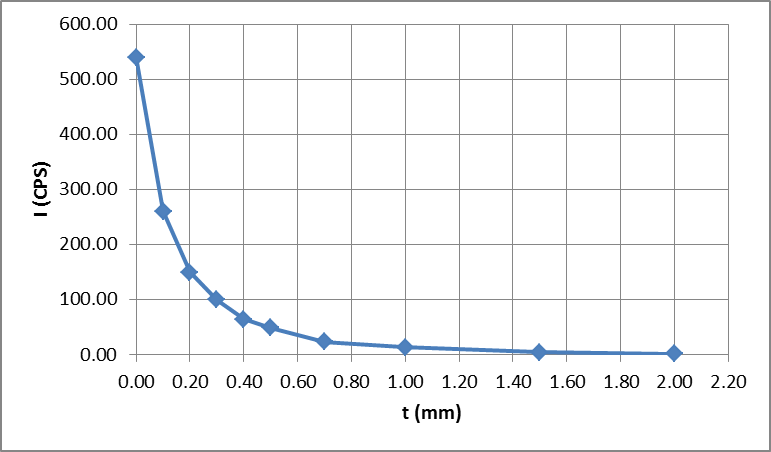 The absorption coefficient of x-rays is not independent of wavelength, so the absorption of the x-rays does not follow a simple exponential decay. The discrepancy from exponential law is more evident for higher voltages because the x radiation generated has shorter wavelength (more energetic or harder radiation). 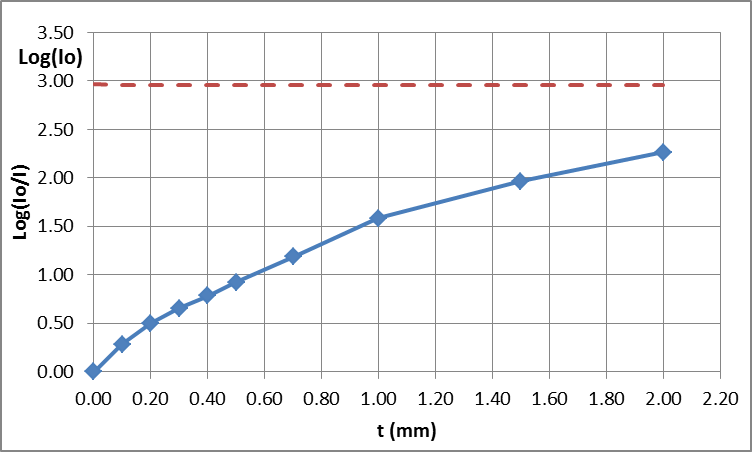 This is clear from our two measurements : at 30 KV and at 40 KV. The least energetic, soft radiation (longer wavelength) is progressively absorbed by the aluminum such that the mean wavelength of the transmitted beam progressively decrease; it thus happen that the quality of the radiation gets harder the deeper the penetration.